“In our country, we don’t just measure progress by the height of our buildings, the size of our airports, or the impact of our investments. 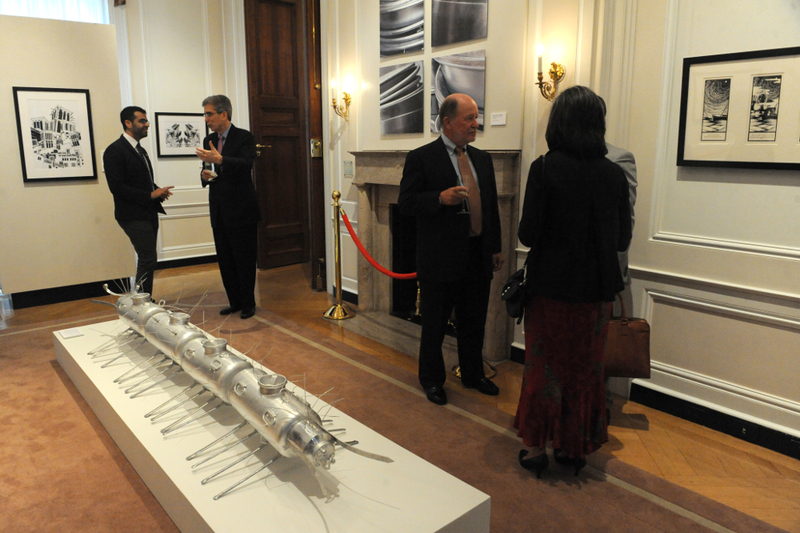 Art has always been at the heart of Emirati society.” These were the opening remarks by UAE Ambassador Yousef Al Otaiba at the unveiling of Past Forward: Contemporary Art from the Emirates, a one-of-a-kind exhibition of Emirati artwork, at a reception on May 21st at the Meridian International Center. The exhibit, a collaboration between the Embassy of the United Arab Emirates in Washington, DC and the Meridian Center for Cultural Diplomacy, features twenty-five artists representing all seven of the nation’s emirates across a variety of artistic genres and styles. It is the first major exhibition of Emirati art to tour outside of the UAE. The various pieces featured in Past Forward combine to tell an interesting narrative of Emirati culture and how it has been influenced by the nation’s rapid transformation over the last four decades since its creation to become one of the Middle East’s most progressive and developed countries. Through a combination of both traditional and contemporary styles and subjects, the artists examine various aspects of life in the Emirates, making reference to the UAE’s important industries, traditions, and social issues. In one piece, a sculpture from his Aluminum Life series, Mohammed Al Qassab examines the importance of aluminum, one of the UAE’s biggest exports, to the UAE’s thriving industry through a large caterpillar like insect formed out of recycled aluminum milk containers. In another piece, a painting, Alia Lootah depicts the constant change she and other Emiratis witness driving through the nation’s cities and looking out on skylines filled with construction cranes. Perhaps the only thing more interesting than the art itself is its overall mission to strengthen UAE-U.S. relations—a mutually important economic and strategic relationship—through cultural diplomacy. 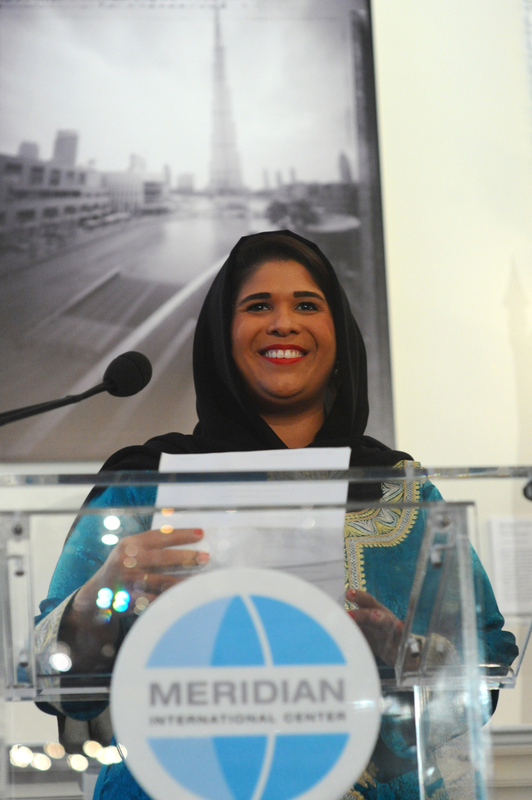 Cultural diplomacy, which emphasizes a softer but nonetheless important side of international relations, centered around sharing culture and ideas between countries, is an important mission of the Meridian International Center, and Past Forward marked the first cultural diplomacy program of the UAE in the United States. 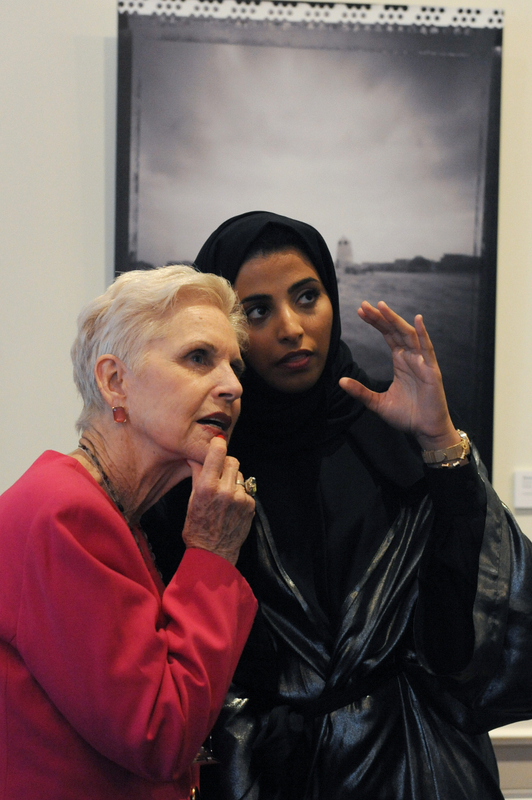 The sponsors and artists of the exhibit hope that it would provide an opportunity for people in the United States to learn about and experience Emirati life and culture through art, and in doing so, foster greater understanding and a stronger relationship between the two countries and their people. Artists Zeinab al Hashemi, Khalid Mezaina, and Maitha al Mehairbi. 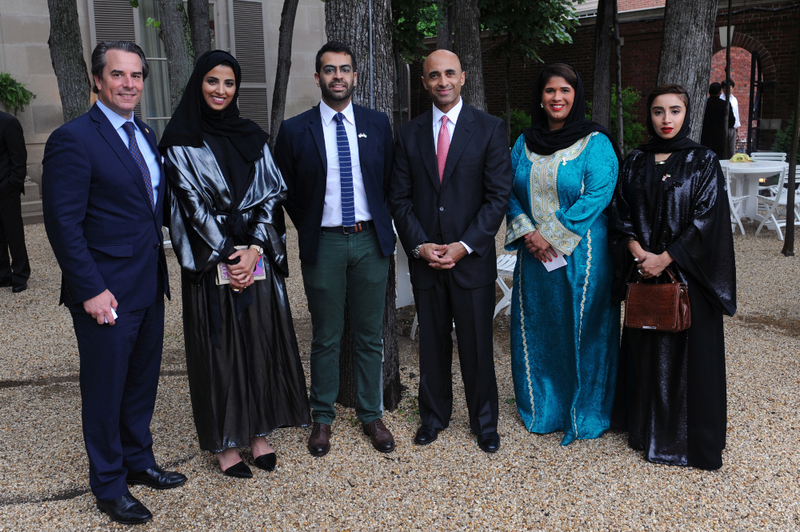 Ambassador Stuart Holliday with Ambassador Yousef Al Otaiba and artists Maitha Al Mehairbi, Khalid Mezaina, Noor Al Suwaidi, and Zeinab Al Hashemi. Artist Maitha al Mehairbi with Jan Du Plain. Attendees at Past Forward on May 21, 2014.